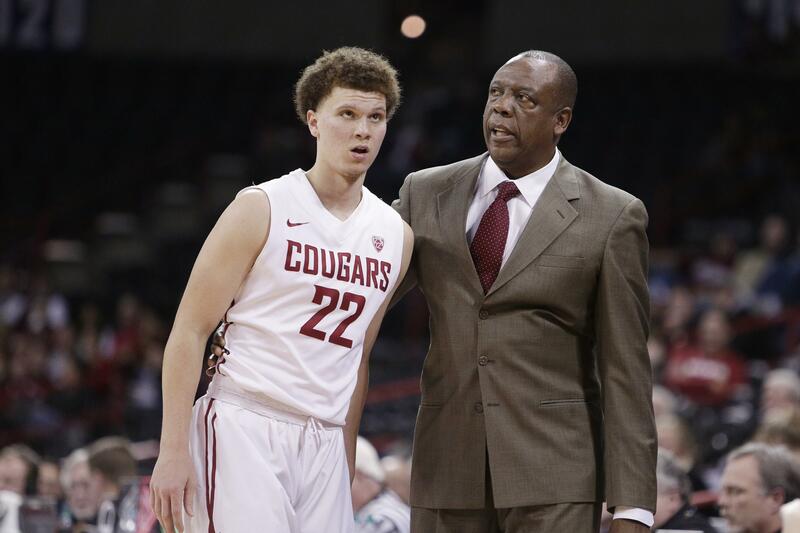 UPDATED: Wed., Nov. 15, 2017, 9:24 p.m.
PULLMAN – Ernie Kent has advertised the 2017-18 Cougars as a team that will shoot the 3-point ball well and one that will usually do it while running laps around its opponent. And Kent has advertised his sophomore transfer, Carter Skaggs, as one of the players who’ll be pulling whenever he has the light of day. Wide-open, claw in the face, it didn’t matter Wednesday night for Skaggs, who got toasty in the second half of a nonleague game against Seattle U and paced the Cougars with 26 points in a 75-59 win over Seattle U at Beasley Coliseum. Granted, leaving Skaggs unmarked didn’t seem like such a brilliant defensive ploy, either. He was so effective from beyond the arc that in the final minutes, he had Redhawk defenders sucking to him with every touch. At one point with about seven minutes left, a flock of three came charging at him. From the top of the perimeter, Skaggs whipped a pass inside to Drick Bernstine – appearing in a Cougars uniform for the first time – and the North Dakota transfer nestled in the easiest bucket of the night. That gave the Cougars their largest lead to that point. It would grow to double-digits and by as many as 19. But that was the only assist of the night for Skaggs. The Cougars could live with a selfish night from the Chipola College (Florida) transfer. Skaggs signed his letter of intent in the middle of August and rescued the Cougars when their top recruit – four-star prospect Roberto Gittens – was ruled academically ineligible earlier that same month. Skaggs didn’t list another Division I hoops offer, but first-year WSU assistant Bennie Seltzer had crossed paths with Pat Skaggs while recruiting Carter at Loyola of Chicago. The Cougars could’ve been in a tight one with the Redhawks without their sweet-shooting sophomore. With 4:03 left in the first half, Skaggs threw up his first long bomb. It rimmed out and the Cougars went into halftime trailing 31-26. Skaggs tried his next 3 two minutes into the second half – after he pulled down a board on the other end – and saw it fall right in. His trigger finger never cooled down after that and Skaggs buried his next six 3-pointers – on just six attempts – to help WSU climb out of a halftime deficit for the third time in as many games. In those nine minutes, the Cougars gave the scoreboard quite the makeover. They trailed 36-32 when Skaggs connected on his first triple, but led 54-48 when he swished his sixth. By the time Skaggs hit No. 7 – another hand-in-the-face special that drew a foul – WSU led 74-56. He capped the four-point play with a free throw to give the Cougars their biggest lead. Viont’e Daniels caught whatever Skaggs had on Wednesday, nailing 4-of-5 3’s to finish with 17 points. Malachi Flynn was the third Cougar in double digits, finishing with 13 points. Bernstine logged 19 minutes in his debut and scored four points to go with four rebounds. Published: Nov. 15, 2017, 9:13 p.m. Updated: Nov. 15, 2017, 9:24 p.m.